A huge surprise at the 2012 Paris Motor Show was the SLS AMG Coupé Electric Drive, proving that Mercedes-AMG is entering a new era. The locally emission-free super sports car featurs advanced technology from the world of Formula 1 and is the most exclusive and dynamic way in which to drive an electric car. The most powerful AMG high-performance vehicle of all time, the SLS AMG Coupe Electic Drive has four electric motors producing a total output of 552 kW and a maximum torque of 1000 Nm, resulting in a 0-62 mph sprint in 3.9 seconds. 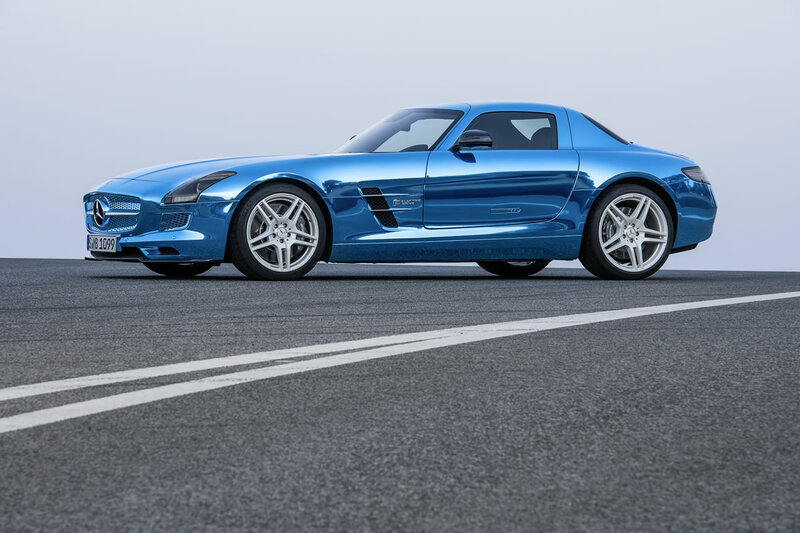 The cost for the SLS AMG Coupe and its one of a kind electric drive, 416,500 Euros ($538,326 based on 9/28/12), with gas prices hitting nearly $5.00 a gallon in California this week, the savings will pile up very quickly. A new dimension of driving performance – a convincing synonym for the AMG brand promise are the outstanding driving dynamics which come courtesy of AMG Torque Dynamics as well as torque distribution to individual wheels, which is made possible by means of wheel-selective all-wheel drive. The most “electrifying” gullwing model ever has been developed in-house by Mercedes-AMG GmbH. The high-voltage battery for the SLS AMG Coupé Electric Drive is the result of cooperation between Mercedes-AMG and Mercedes AMG High Performance Powertrains in Brixworth (GB). This is an area in which the British Formula 1 experts were able to contribute their extensive know-how with KERS hybrid concepts. “The SLS AMG Coupé Electric Drive is setting new standards for cars with electric drives. As the most powerful gullwing model ever, it is also representative of the enduring innovational strength of Mercedes-AMG. Our vision of the most dynamic electric vehicle has become a reality. With the help of our colleagues at Mercedes AMG High Performance Powertrains in Brixworth, we are bringing exciting advanced technology from the world of Formula 1 to the road”, according to Ola Källenius, Chairman of the Board of Management of Mercedes-AMG GmbH. Pioneering, visionary, electrifying: the powerful and locally emission-free super sports car with electric drive also embodies the development competence of Mercedes-AMG GmbH. With this innovative and unique drive solution, AMG – as the performance brand of Mercedes-Benz – is demonstrating its technological leadership in this segment. 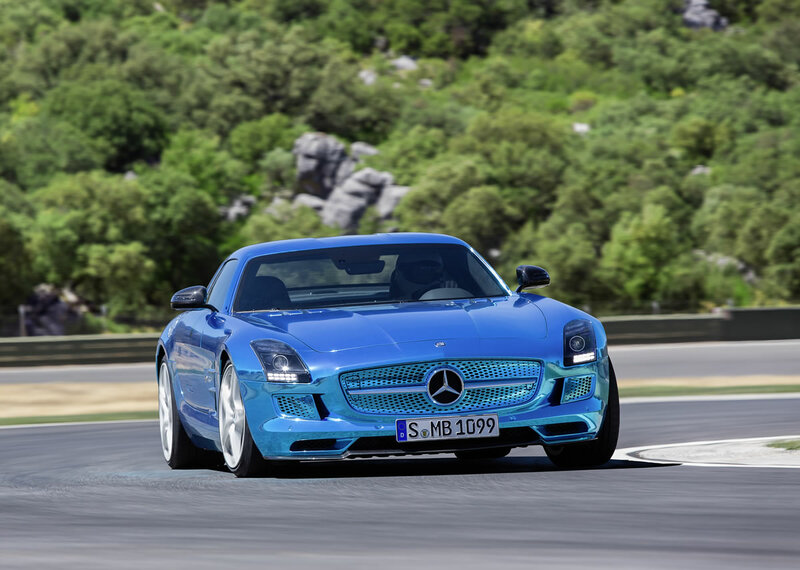 The SLS AMG Coupé Electric Drive is aimed at technology-minded super sports car fans who are open to new ideas and enthusiastic about ambitious high-tech solutions for the future of motoring. The pioneering drive package in the SLS AMG Coupé Electric Drive is impressive and guarantees a completely innovative and electrifying driving experience: enormous thrust comes courtesy of four synchronous electric motors providing a combined maximum output of 552 kW and maximum torque of 1000 Nm. The very special gullwing model accelerates from zero to 100 km/h in 3.9 seconds, and can reach a top speed of 250 km/h (electronically limited). The agile response to accelerator pedal input and the linear power output provide pure excitement: unlike with a combustion engine, the build-up of torque is instantaneous with electric motors – maximum torque is effectively available from a standstill. The spontaneous build-up of torque and the forceful power delivery without any interruption of tractive power are combined with completely vibration-free engine running characteristics. The four compact permanent-magnet synchronous electric motors, each weighing 45 kg, achieve a maximum individual speed of 13,000 rpm and in each case drive the 4 wheels selectively via a axially-arranged transmission design. This enables the unique distribution of torque to individual wheels, which would normally only be possible with wheel hub motors which have the disadvantage of generating considerable unsprung masses. Powerful, voluminous, dynamic, emotional and authentic: the characteristic sound of the SLS AMG Coupé Electric Drive embodies the sound of the 21st century. After an elaborate series of tests as well as numerous test drives, the AMG experts have created a sound which captures the exceptional dynamism of this unique super sports car with electric drive. Starting with a characteristic start-up sound, which rings out on pressing the “Power” button on the AMG DRIVE UNIT, the occupants can experience a tailor-made driving sound for each driving situation: incredibly dynamic when accelerating, subdued when cruising and as equally characteristic during recuperation. 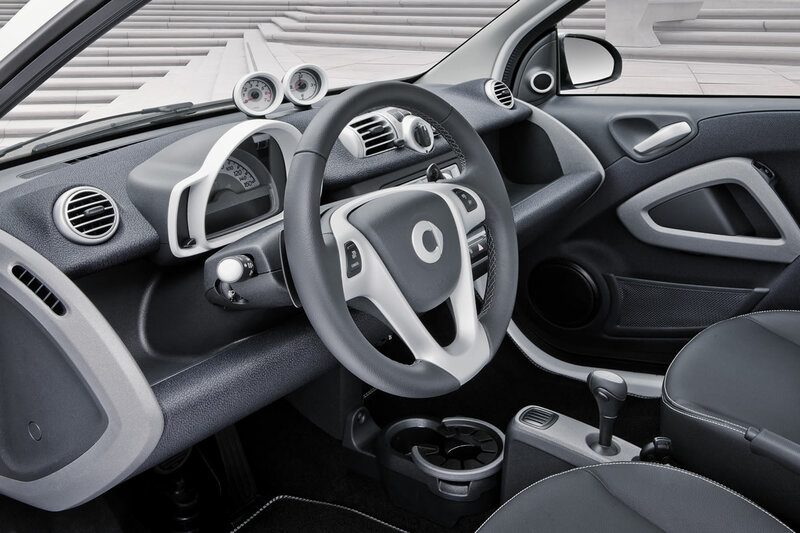 The sound is not only dependent on road speed, engine speed and load conditions, but also reflects the driving situation and the vehicle’s operating state with a suitable driving noise. Perfect feedback for the driver is guaranteed thanks to a combination of the composed sound, the use of the vehicle’s existing inherent noises and the elimination of background noise – this is referred to by the experts as “sound cleaning”. The impressive sound comes courtesy of the standard sound system with eleven loudspeakers. Battery efficiency, performance and weight: in all three areas Mercedes-AMG is setting new standards. 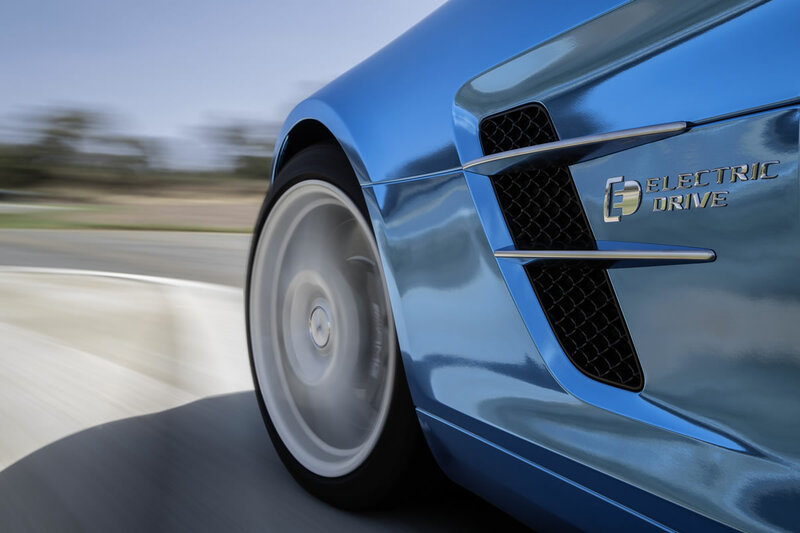 The high-voltage battery in the SLS AMG Coupé Electric Drive boasts an energy content of 60 kWh, an electric load potential of 600 kW and weighs 548 kg – all of which are absolute best values in the automotive sector. The liquid-cooled lithium-ion high-voltage battery features a modular design and a maximum voltage of 400 V.
Advanced technology and know-how from the world of Formula 1 have been called on during both the development and production stages: the battery is the first result of the cooperation between Mercedes-AMG GmbH in Affalterbach and Mercedes AMG High Performance Powertrains Ltd. Headquartered in Brixworth in England, the company has been working closely with Mercedes-AMG for a number of years. F1 engine experts have benefited from its extensive expertise with the KERS hybrid concept, which made its debut in the 2009 Formula 1 season. At the Hungarian Grand Prix in 2009, Lewis Hamilton achieved the first historic victory for a Formula 1 vehicle featuring KERS hybrid technology in the form of the Mercedes-Benz KER System. Mercedes AMG High Performance Powertrains supplies the Formula 1 teams MERCEDES AMG PETRONAS, Vodafone McLaren Mercedes and Sahara Force India with Mercedes V8 engines and the KERS. The high-voltage battery consists of 12 modules each comprising 72 lithium-ion cells. This optimised arrangement of a total of 864 cells has benefits not only in terms of best use of the installation space, but also in terms of performance. One technical feature is the intelligent parallel circuit of the individual battery modules – this helps to maximise the safety, reliability and service life of the battery. As in Formula 1, the battery is charged by means of targeted recuperation during deceleration whilst the car is being driven. A high-performance electronic control system converts the direct current from the high-voltage battery into the three-phase alternating current which is required for the synchronous motors and regulates the energy flow for all operating conditions. Two low-temperature cooling circuits ensure that the four electric motors and the power electronics are maintained at an even operating temperature. A separate low-temperature circuit is responsible for cooling the high-voltage lithium-ion battery. In low external temperatures, the battery is quickly brought up to optimum operating temperature with the aid of an electric heating element. In extremely high external temperatures, the cooling circuit for the battery can be additionally boosted with the aid of the air conditioning. This also helps to preserve the overall service life of the battery system. Ideally the SLS AMG Coupé Electric Drive is charged with the aid of a so-called wall box. Installed in a home garage, this technology provides a 22 kW quick-charge function, which is the same as the charging performance available at a public charging station. A high-voltage power cable is used to connect the vehicle to the wall box, and enables charging to take place in around three hours. Without the wall box, charging takes around 20 hours. 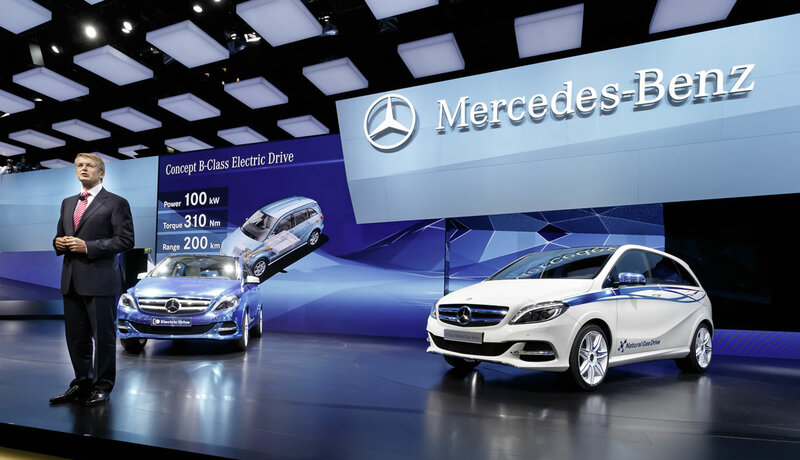 The wall box is provided as an optional extra from Mercedes-AMG in cooperation with SPX and KEBA, two suppliers of innovative electric charging infrastructures for the automotive industry. By using this design, Mercedes-AMG ensures maximum safety during production of the vehicle and also during maintenance and repair work. Of course the SLS AMG Coupé Electric Drive also meets all of the statutory and internal Mercedes crash test requirements. AMG Torque Dynamics enables optimum use of the adhesion potential between the tyres and the road surface in all driving conditions. The technology allows maximum levels of freedom and as such optimum use of the critical limits of the vehicle’s driving dynamics. Outstanding handling safety is always assured thanks to the two-stage Electronic Stability Program ESP®. The trailblazing body shell structure of the SLS AMG Coupé Electric Drive is part of the ambitious “AMG Lightweight Performance” design strategy. The battery is located within a carbon-fibre monocoque which forms an integral part of the gullwing model and acts as its “spine”. The monocoque housing is firmly bolted and bonded to the aluminium spaceframe body. The fibre composite materials have their roots in the world of Formula 1, among other areas. The advantages of CFRP (carbon-fibre reinforced plastic) were exploited by the Mercedes-AMG engineers in the design of the monocoque. These include their high strength, which makes it possible to create extremely rigid structures in terms of torsion and bending, excellent crash performance and low weight. Carbon-fibre components are up to 50 percent lighter than comparable steel ones, yet retain the same level of stability. Compared with aluminium, the weight saving is still around 30 percent, while the material is considerably thinner. The weight advantages achieved through the carbon-fibre battery monocoque are reflected in the agility of the SLS AMG Coupé Electric Drive and, in conjunction with the wheel-selective four-wheel drive system, ensure true driving enjoyment. The carbon-fibre battery monocoque is, in addition, conceived as a “zero intrusion cell” in order to meet the very highest expectations in terms of crash safety. It protects the battery modules inside the vehicle from deformation or damage in the event of a crash. The basis for CFRP construction is provided by fine carbon fibres, ten times thinner than a human hair. A length of this innovative fibre reaching from here to the moon would weigh a mere 25 grams. Between 1000 and 24,000 of these fibres are used to form individual strands. Machines then weave and sew them into fibre mats several layers thick, which can be moulded into three-dimensional shapes. When injected with liquid synthetic resin, this hardens to give the desired structure its final shape and stability. The purely electric drive system was factored into the equation as early as the concept phase when the super sports car was being developed. It is ideally packaged for the integration of the high-performance, zero-emission technology: by way of example, the four electric motors and the two transmissions can be positioned as close to the four wheels as possible and very low down in the vehicle. The same applies to the modular high-voltage battery. Advantages of this solution include the vehicle’s low centre of gravity and balanced weight distribution – ideal conditions for optimum handling, which the electrically-powered gullwing model shares with its petrol-driven sister model. The additional front-wheel drive called for a newly designed front axle: unlike the series production vehicle with AMG V8 engine, which has a double wishbone axle, the SLS AMG Coupé Electric Drive features an independent multi-link suspension with pushrod damper struts. This is because the vertically-arranged damper struts had to make way for the additional drive shafts. As is usual in a wide variety of racing vehicles, horizontal damper struts are now used, which are operated via separate push rods and transfer levers. Thanks to this sophisticated front-axle design, which has already been tried and tested in the world of motorsport, the agility and driving dynamics of the SLS AMG Coupé Electric Drive attain the same high levels as the V8 variant. Another distinguishing feature is the speed-sensitive power steering with rack-and-pinion steering gear: the power assistance is implemented electrohydraulically rather than just hydraulically. 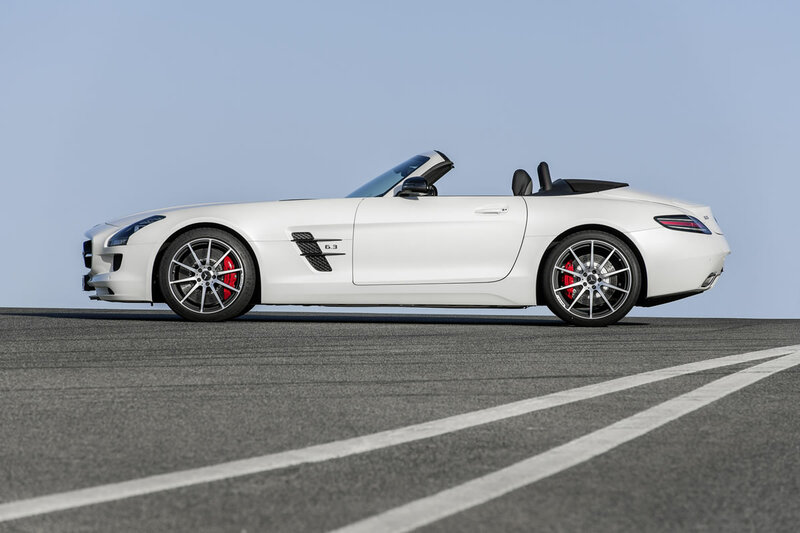 The SLS AMG Coupé Electric Drive is slowed with the aid of AMG high-performance ceramic composite brakes, which boast direct brake response, a precise actuation point and outstanding fade resistance, even in extreme operating conditions. The over-sized discs – measuring 402 x 39 mm at the front and 360 x 32 mm at the rear – are made of carbon fibre-strengthened ceramic, feature an integral design all round and are connected to an aluminium bowl in a radially floating arrangement. The ceramic brake discs are 40 percent lighter in weight than the conventional, grey cast iron brake discs. The reduction in unsprung masses not only improves handling dynamics and agility, but also ride comfort and tyre grip. The lower rotating masses at the front axle also ensure a more direct steering response – which is particularly noticeable when taking motorway bends at high speed. 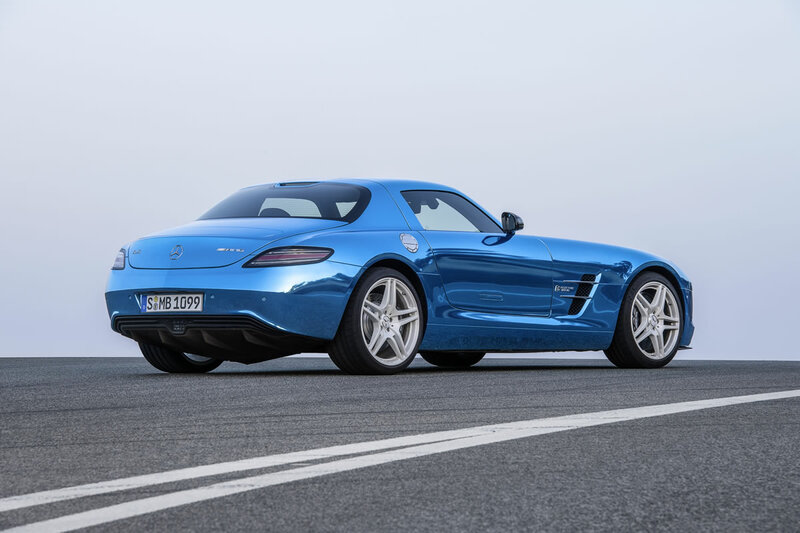 Visually, the multi-award-winning design of the SLS AMG is combined with a number of specific features which are exclusive to the Electric Drive variant. The front apron has a striking carbon-look CFRP front splitter which generates downforce on the front axle. The radiator grille and adjacent air intakes adorn special areas painted in the vehicle colour and with bionic honeycomb-shaped openings. They are not only a visual highlight but, thanks to their aerodynamically optimised design, also improve air flow over the cooling modules mounted behind them. Darkened headlamps also impart a sense of independence to the front section. Viewed from the side, the “Electric Drive” lettering stands out on the vehicle side, as do the AMG 5-twin-spoke light-alloy wheels with their specific paint design. The SLS AMG Electric Drive comes as standard with 265/35 R 19 tyres on the front and 295/30 R 20 tyres on the rear. The overall look is rounded off to dynamic effect by the new diffuser-look rear apron, and the darkened rear lamps. 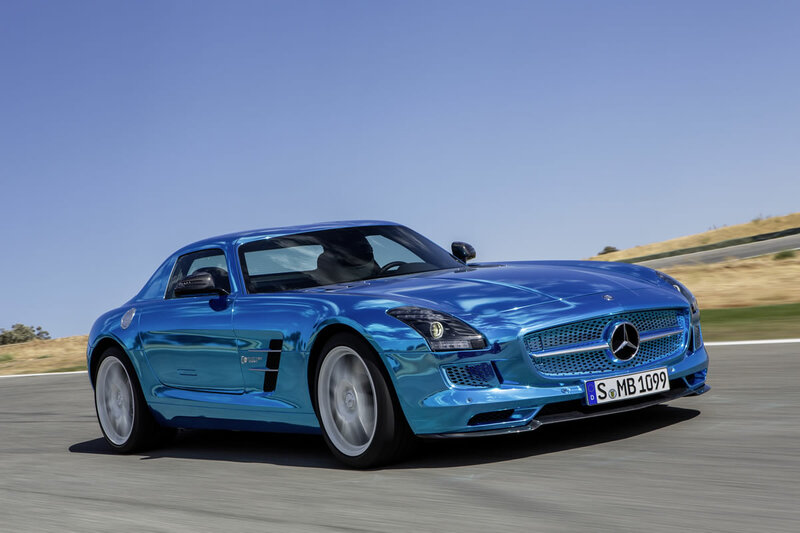 One feature reserved exclusively for the SLS AMG Coupé Electric Drive is the “AMG electricbeam magno” matt paint finish. A choice of five other colours is available at no extra cost. When the exterior colour AMG electricbeam magno is chosen, the high-quality, sporty interior makes use of this body colour for the contrasting stitching – the stitching co-ordinates perfectly with designo black Exclusive leather appointments. AMG sports seats and numerous carbon-fibre trim elements in the interior underscore the exclusive and dynamic character of what is currently the fastest electric car. Behind the new AMG Performance steering wheel there is a newly designed AMG instrument cluster: instead of a rev counter, there is a power display providing information on the power requirements, recuperation status, transmission modes and battery charge. The AMG DRIVE UNIT comprises the electronic rotary switch for selecting the three transmission modes of “C” (Controlled Efficiency), “S” (Sport) and “S+” (Sport plus), which the driver can use to specify different performance levels from the electric motors, which in turn also changes the top speed and accelerator pedal response. Behind the buttons for “power” and “ESP On/Off”, there are also buttons for AMG Torque Dynamics and AMG Setup.